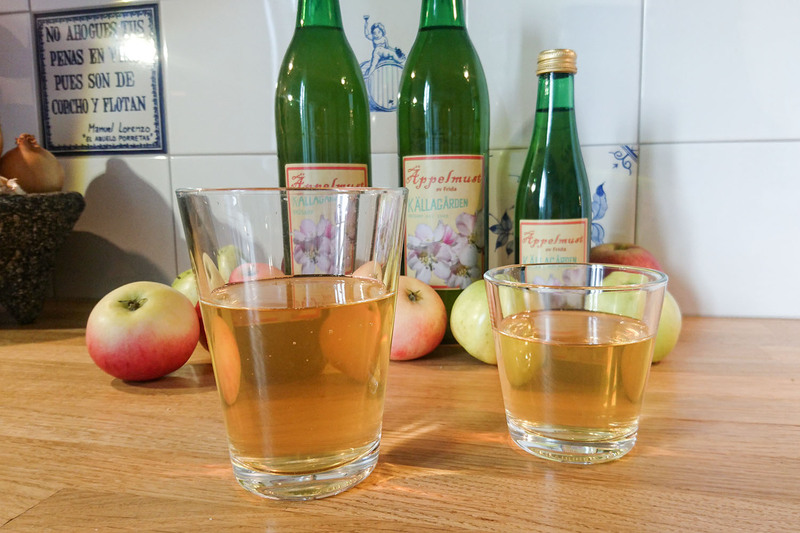 Källagården’s apple juice is produced by old-fashioned cold pressing of sun-dried apples from our own apple trees. It is available in two varieties, each with its unique and characteristic flavor, and without additives. We sell the apple juice, apples and pears at our self-service farm stand, but you can also buy it at the local ICA Supermarket and gas station OK/Q8 in Brösarp. APPLE JUICE ORIGINAL: This is our original apple juice, cold pressed from the apple varieties Aroma, Discovery, Summerred and Signe Tillisch. This combination creates an exquisite balance between sweetness and fruity, with depth and body. The juice contains pulp and is pasteurised for increased shelf life. 100% apple juice in a bottle of 750 ml/30 SEK, 6 bottles/170 SEK. APPLE JUICE FRIDA: The Frida apple juice is pressed only from the Frida apple variety, all for the apple’s own character to be as clear as possible. The Frida apple is a new Swedish apple cultivar and is a crossbreed between Aroma and a North American “dad” without a name. Frida makes a slightly sweeter juice with a well-balanced fruity acidity. The juice contains pulp and is pasteurised for increased shelf life. 100% apple juice in a bottle of 750 ml/30 SEK, 6 bottles/170 SEK, and a bottle of 250 ml/15 SEK. 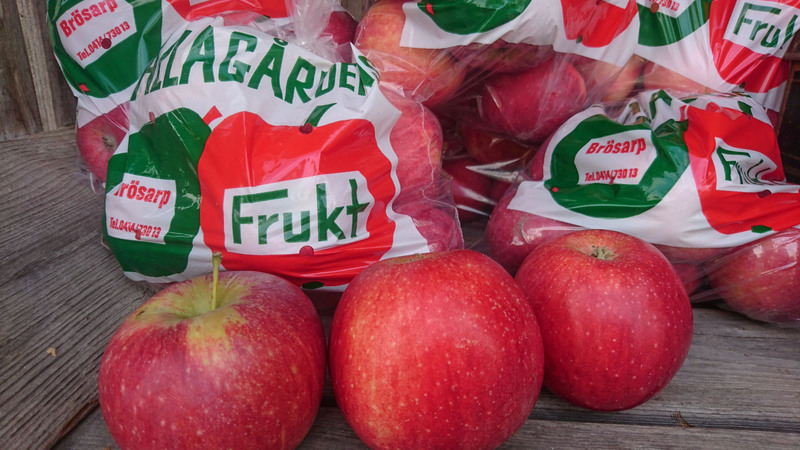 FRUIT: Here you can buy Källagården’s own apples and pears, certified by Svenskt Sigill. Varieties and availability vary during the season and also depends on stock and durability. Usially we have apples for sale until February or March. Pre-packaged in bags of 1 kg/25 SEK. Källagården’s fruit – apples in the farm stand. Apple juice original, 750 ml. Apple juice Frida, 250 and 750 ml.